SCVHistory.com | Melody Ranch | Gene Autry's Melody Ranch Memories. 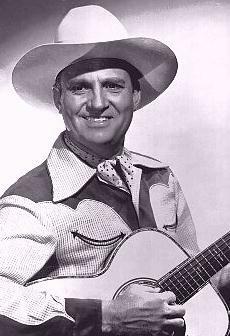 By Gene Autry, Singing Cowboy. Exclusive to the Old Town Newhall Gazette | November-December 1995. Under A Blazing Newhall Sun, Director John Ford Punished The Duke For Staggering Onto The Set Several Hours Late. When I bought the old Melody Ranch, as I called it, from Monogram Pictures, it had been used for the filming of hundreds of Western movies with stars like Harry Carey, Johnny Mack Brown, Bob Steele, Tom Tyler and many more. My first feature picture for Republic Studios, Tumbling Tumbleweeds, had been filmed at the Placerita Canyon ranch in 1935. Years later, in 1958, John Wayne and I worked there together for the first time in a television special called "The Western" for the NBC series Wide, Wide World. Directed by John Ford, the 90-minute show was essentially a history of the Western movie, with a cast that included Walter Brennan, Ward Bond, James Arness, Gabby Hayes, James Garner and dozens of familiar cowboy and Indian faces. The novelty of working for the first time with John Wayne at Melody Ranch, more than twenty years after we were the first two players under contract when Republic Pictures was formed in 1935, would have been reason enough to remember that day. But what has stayed with me in the years since then was the unique relationship between John Wayne and John Ford. John Wayne was a man without pretense. He could be tough and rowdy, but in the presence of Ford, whom he revered, he could be as obedient and innocent as an altar boy. The night before the telecast Duke lost track of the time, did some serious partying, and arrived on the Melody Ranch set two or three hours late with a head quite sensitive to loud noises. Ford's voice must have sounded like a hammer beating against the lid of a garbage can. He was furious. He berated Wayne for holding up rehearsal and inconveniencing the rest of the cast. Duke just kept ducking his head and scuffing his toe in the sand and repeating, "I'm sorry, boss." Wayne's part required him to walk down the Western street where High Noon's immortal face-down occurred, as he recited his lines from the script. Ford punished him by demanding endless run-throughs over that quarter-mile stretch of red dust, under a blistering desert sun. "And you'll not get so much as a drop of water," Ford roared. "Do you HEAR me?" While the Duke was suffering his penance, Ford sidled up to me and said, "Gene, about twenty minutes before we go on the air I want you to give Duke a good, healthy slug of Bourbon. And halfway through the show, give him another. But don't let him know that I know." I understood. I walked over to the ranch house, took a Coke out of the refrigerator, emptied half of it into the sink, and filled up the bottle with Bourbon. As I recall, we rehearsed until four-thirty and were to hit the air live half an hour later, catching the East at prime time. Wayne was standing off-camera with his tongue hanging out when I sauntered up to him, holding out the bottle of Coke. "Here, Duke," I said. "Have a swallow of this. I think it will help you." His face puckered up, and he waved the offer aside with a short chop of his hand. "Get that mouthwash away from me," he growled. "You want to get me sick?" As sternly as I could, I said, "Duke, I'm telling you, this is just what you need. Try it. Take a sip." He looked at me a little suspiciously, took the bottle, and tilted it to his lips. His eyes got as round as saucers. When he handed me the empty he said, "Autry, you may have saved a man's life." Halfway through the show I performed the same errand. The second time, Wayne didn't have to be persuaded. Years later, after his success in the movie True Grit, I received a package in the mail from Wayne. It contained a glossy photograph of himself as Rooster Cogburn, with the patch over one eye. The inscription said: "To Gene Autry. A lot of water has gone under the bridge. And whiskey, too." When a fire all but devastated Melody Ranch in August 1962, what I lost could not be replaced or even measured. The ranch was in the path of the terrible firestorm that raged through the San Gabriel Mountains. Covering one hundred acres, the ranch had once been one of the finest in the business when Monogram owned it. I had purchased it ten years before the fire, leasing it for the filming of such shows as Gunsmoke and Wyatt Earp, as well as those produced by my own company, Flying A Pictures. I had always planned to erect a Western museum there, but priceless Indian relics and a collection of rare guns, including a set used by Billy the Kid, went up in smoke. Thank God, the ranch hands and all fourteen of our horses were uninjured. The fire left the terrain so convincingly battle-scarred that it was used two months later for an episode of television's war series, Combat. The network special with Wayne and Ford would be the last time I went before the cameras at Melody Ranch. I have been back only a very few times. I kept it until the last living Champion died and then sold it to two enthusiastic young men, Renaud and Andre Veluzat, who decided to rebuild it. Now, in the Nineties, it is once again the site of much filming of features and television. As for my plans for a Western museum, this came to fruition with the opening in 1988  after much hard work spearheaded by my wife Jackie and Joanne Hale  of the Autry Museum of Western Heritage, located in Griffith Park opposite the Los Angeles Zoo. The Autry National Center is open Tuesday through Sunday from 10 a.m. to 5 p.m. Take I-5 south to Western Ave. and turn right. Turn left at Victory Blvd. and follow the signs. Admission is $7.50, with discounts for seniors and students. For more information, call 213-667-2000.